I am trying to find out more about what my grandfather experienced in The Great War. He served in the 7th Battalion of the Leicestershire Regiment 110th Brigade from 1914 - Dec 1917 as an enlisted soldier. In December, 1917 he went to Cadet School and received a commission as a 2nd Lt. in the 3rd Battalion of the Leicestershire Regiment on May 31, 1918. I have received some of his military records, 7th Battalion war diaries (WO-95-2164-2_1&2, WO-95-2530-3) from the National Archives and have ordered the book "The Tigers" by Matthew Richardson. The war diaries are an amazing source of information, but I have a difficult time deciphering the war diaries due to the cursive writing. Are there any "typed" versions of the war diaries or any other sources of information for the 7th Battalion that describe what he may have experienced that anyone recommends? My research shows the 7th Battalion was involved in the following battles. I wonder if that means that he was involved in some of those battles? Battle of Bazentin. 14-17 Jul 1916, including the capture of Longueval, Trones Wood and Ovillers. Battle of Flers-Courcelette. 15-22 Sep 1916, including the capture of Martinpuich. Battle of Morval. 25-28 Sep 1916, including the capture of Combles, Lesboeufs and Gueudecourt. Battle of Le Transloy. 1-18 Oct 1916, including the capture of Eaucourt l’Abbaye, Le Sars and the attacks on Butte de Warlencourt. First Battle of the Scarpe. 9-14 Apr 1917, including the capture Monchy le Preux and the Wancourt Ridge. Third Battle of the Scarpe. 3-4 May 1917, including the capture of Fresnoy. Actions on the Hindenburg line. 20 May-16 Jun 1917. Battle of Polygon Wood. 26 Sep-3 Oct 1917. Battle of Broodside. 4 Oct 1917. Second Battle of Passchendaele. 26 Oct-10 Nov 1917. When he was commissioned as 2nd Lt. he requested the Leicester Regiment and was placed in the 3rd Battalion. On his "Protection Certificate (Officer)" it lists under Theatre of War or Command: "Russia - 3rd Leicesters", Unit with which last serving: "Karaleius (Russian)". I have a newspaper article similar that says he was an interpreter for the Imperial Army in Russia: stationed in Moscow from 1917 to 1919. I don't believe the 3rd was ever in Russia. However my grandfather told me, when I was a teenager, that he also served in the British Secret Service (because he also spoke Russian, German and French). I have asked MI5 and MI6 for his records, but I don't expect a response. Any suggestions on how I might research his service in Russia? 'Enlisted' is a rather American term. the 7th Leicesters was a Kitchener or New Army battalion and he would have been a volunteer; my grandfather served in 7th Leicesters throughout the war. Enlisted, certainly in WWI, in US terms can mean different routes to joining, i.e. volunteering or conscripted/drafted. The WD is a fairly useful document, although I must admit that it is over thirty years since I looked at it (!). Also useful would be the Brigade WD, as this often has more mapping than the battalion WDs. The Brigade had a rather quiet first year, which came to an end with a heavy dose of reality at Bazentin-le-Petit on 14/15 July 1916. To get a good idea of life in the earlier years of the war, I would recommend a beautifully written memoir by IL Read, Of those we loved. First published in 1994, it was reprinted by Pen and Sword and may still be easily available. He also was commissioned, but went to the Sussex Regiment. Over half the book is of his time with the 8th Leicesters, part of 110 (Leicesters) Brigade. Thank you so much for the information. I just ordered/downloaded the 100th Brigade War Diaries from the National Archives and have ordered the memoir, Of Those We Loved. As you can tell, I am American, but a British ally forever. My family and I greatly appreciates your help. was the West Deeping one the address of his parents and the other his own address. 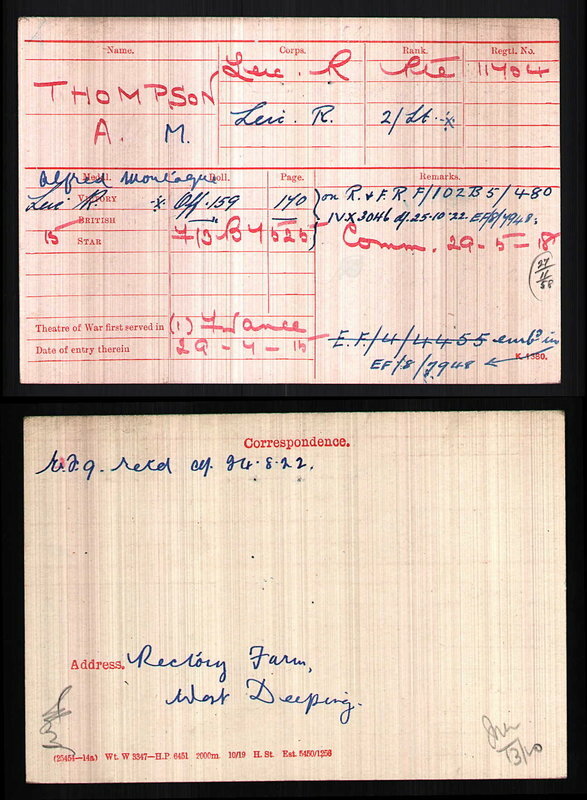 The war diaries are also available on Ancestry and may be easier to read there. My grandfather also served with 7 Leics from Aug 1914 to Mar 1918 when he was wounded at Epehy and awarded the DCM. His older brother enlisted at the same time with 7 Leics and served until Jan 1919. TTracer 44, You are very observant (and not nosy at all) about his address. Yes, his parents (or permanent) address is in Wissendine. His older brother's address after the war is Rectory Farm, West Deeping - which now is an archeology site for prehistoric pottery. Thanks for inquiring. Ellis1918, Thanks for the tip on the War Diaries. Interesting information about your grandfather and his brother. My grandfather was also wounded. His records only state "wounded July, 1916". Maybe Benzentin Ridge battle? I don't know. By the way, where is that Leicestershire Regiment plaque mounted? After doing all the research, I want to visit my grandfather's birthplace, his home town, brother's home town, the Leicestershire Regiment Headquarters and of course the battle sites where he served. I don't want to miss the plaque. Thanks for sharing. His records only state "wounded July, 1916". Maybe Benzentin Ridge battle? I don't know. and there's also a book on Bazentin Ridge in the Battleground Europe series which goes in to some detail on the events. 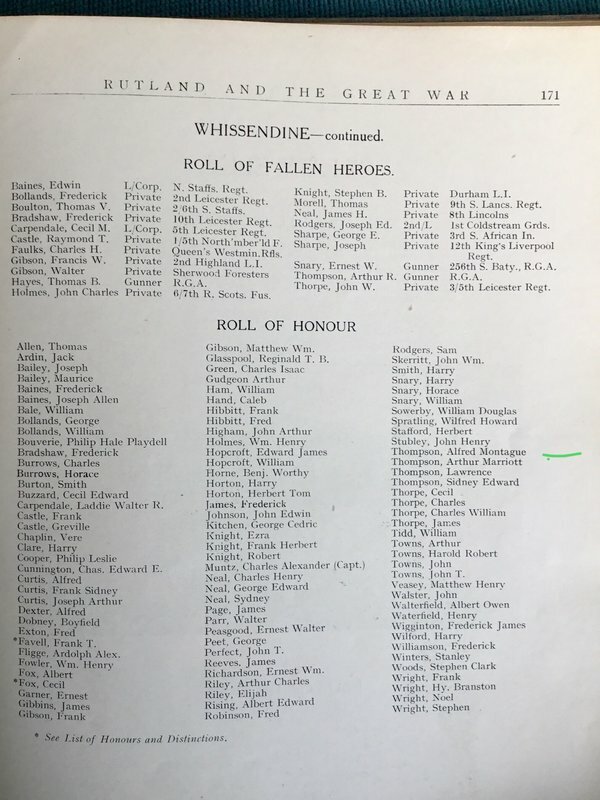 Not sure if you are aware of the book ( Rutland and the Great War )as Whissendine comes within this county of Rutland your Grandfather appears in the Roll of Honour. My grandfathers 7 Leics service number was 13392 and his brothers 13402, both enlisted Aug 1914 in Maltby , South Yorkshire. They were both coal miners and lived about 70 miles from Leicester. A few days after his 20th birthday in 1915 he boarded the troopship SS Onward for France with 110th Brigade . In July 1916 , as a sergeant with A company , he fought at the battle of Bazentin Ridge and in Sep 1916 at Morval on the Somme . In November 1916 he was wounded at Hoenzollern ( Gun Shot Wound right thigh) and treated firstly at No 1 casualty clearing station at Choques ,before being transferred on 31 Ambulance train to a Base hospital at Boulogne then evacuated back to England. On 5 Dec 1916 he was admitted to the County of Middlesex hospital , Napsbury and discharged in Feb 1917 returning to the front shortly after. Aged 22 he was awarded the Distinguished Conduct Medal for conspicuous gallantry for leading bombing attacks three times to recapture a trench from the enemy at Epehy in March 1918. He was severely wounded and discharged in Sept 1918. In 1921 he enlisted in the Queens Own Yorkshire Dragoons and served until 1927. During the Second World was he served in the 59th West Riding (Rotherham) Home Guard from May 1940 to July 1943 reaching the rank of Lieutenant. The plaque ( as stated on it ) is at Berles-au-Bois. In 2011 I retraced his journey across France with the aid of information kindly suppled by forum member Adam Llewellyn , a Tigers expert. Ellis1918, fascinating story - thanks for sharing it me! Perhaps, my grandfather (Al Thompson) and your knew each other. 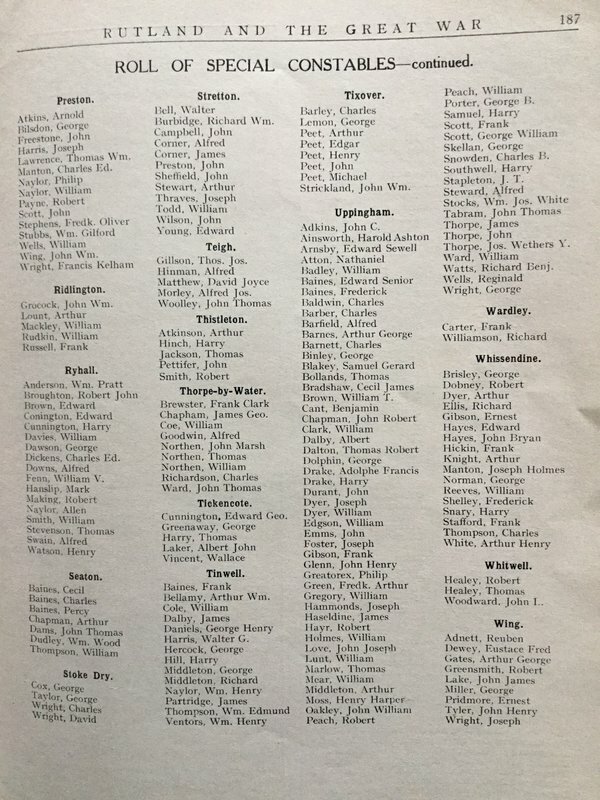 Would you know if the other Thompson’s on that page are relatives, the reason I ask is that those that are in the fallen will have a photo, plus there are lists for those who served as Special Constables and also who served in the Rutland Volunteer Regiment, this was for home defence, there are Thompson’s in both these areas so could be gt grandfather or gt uncles, I’m happy to send the info. I am trying to verify that the 7th Leicesters were "attached" to B Company (of the 21st Division) and determine about many men there were. From "The Tigers" by Matthew Richardson - ""On 14 July the task of 110th brigade ( 6th, 7th , 8th & 9th battns Leic reg) was to storm the German positions on Bazentin Ridge , between Mametz Wood and Bazentin le Petit Wood. 6th and 7th battns were to lead the attack with D company of 8th battn and they were drawn up in 4 waves. The rest of 8th battn and 9th were to follow in support. D co 8th battn on the left were to skirt around the northern edge of Bazentin le Petit Wood , the 7th battn in the centre and 8th battn on the right would enter the wood. The 3 remaining companies of the 8th battn and all 4 of the 9th battn would follow them in."" This can be seen on the map you posted. The bold type C , B and A Co along the edge of Mametz Wood south of the Contalmaison Road refer to the companies of the 8th battn positioned in support. C in support of 8th battn , B in support of 7th battn and A in support of 6th battn. Attached photos - Mametz Wood looking from the Welsh 38th division memorial , Mametz Wood looking from Bazentin le Petit Wood roughly the Flat Iron trench position. This is the open ground they advanced across. Of Whissendine be your Gt grandfather, my guess is these positions would have been taken on by the older residents. Hi Den, Yes, Charles Thompson was my greatfather (AM Thompson's father). Interesting. Thanks for sharing those photos with us, the top one has a Russian flavour to it, I would be pleased to own one of those great coats, they certainly look like they are serving there purpose. I like the second photo, he looks like a contented man after what he saw twenty years previous, mind you living in the wilderness of Canada would clear anyones mind of trouble. special constables, nursing, charity groups, it’s all in the book, most of this info unless your relative wrote it down and passed it on, isn’t available anywhere else. Good luck with your research and please ask if you think I may have something of interest within the book. "Karaleius (Russian)" may be a reference to the 'Karelian Regiment', a British raised and equipped unit of local Russians who lived on the frontier between Murmansk and Finland. They remained part of the North Russia Expeditionary Force until evacuation in late 1919. The Karelian Regiment was commanded by Lieut.-Col. Phillip Woods, DSO, Royal Irish Rifles. The unit insignia was a green shamrock on orange backing, Woods dubbed the unit his 'Irish Karelians'. Eventually a 2nd (Olonetz) Bn. was formed under Maj. Lewis Drake-Brockman, RMLI (who was later KIA in the defence of Karelskaya on 10 May 1919). 3rd Leicesters did not serve in Russia 1918-20. Your Grandfather would have been attached to 'SYREN Force', NREF as an interpreter. Most of the interpreters for North Russia were commissioned into 'General List' for the purpose however if your Grandfather already held a commission he would have served in Russia as a member of his parent regiment. My grandfather started as a private in the 7th Battalion from 1914 - Dec 1917. In December, 1917 he went to Cadet School and received a commission as a 2nd Lt., (stating on another form "Unit Preference: Leicester, Regular Army") in what's listed as the "3rd Battalion" of the Leicestershire Regiment on May 31, 1918. His commissioning papers (below) also listed him with the 3rd. 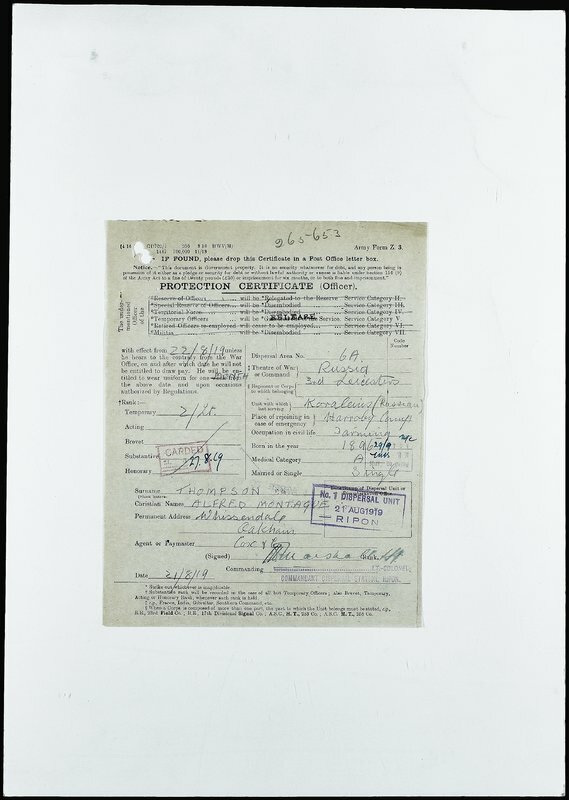 The next two pictures are of the document that lists him in Russia - with the 3rd Leicesters. Perhaps he actually was assigned to a "General List", but actually remained in the 7th and possibly assigned to the "Karelian Regiment"?